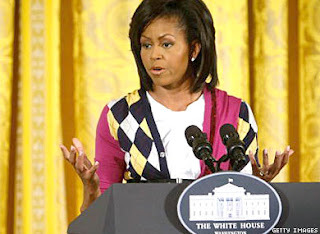 Okay - so I have a huge gay crush on the FLOTUS (First Lady of the United States) Michelle Obama. She is poised, elegant, and charismatic. And today she attended the swearing in of John Berry, the openly gay man that is now the director of the Office of Personnel Management. He will be running an office that was once known for identifying and firing individuals for being homosexual. I'm excited to see that her commitment to be an ally of the LGBT community continue. I'm also excited to see openly gay individuals continue to be placed in positions of influence within the Obama administration. It's nice to see him recognize and honor members of our community. Now if we can only get him to repeal Don't Ask, Don't Tell and the Defense of Marriage Act. But I understand, I guess we have to start with small steps. Congratulations John Berry.